Zainab joined the Practice in 2015. Originally from Kenya, Zainab graduated from the University of Nairobi in 1993 and has worked in various government hospitals including Mombasa, Kenya and the Sultanate of Oman. She has also travelled to many developing countries including Jamaica, Oman and Brazil to give lectures to primary school children on oral hygiene. For the past 12 years she has been practicing general dentistry in the UK. 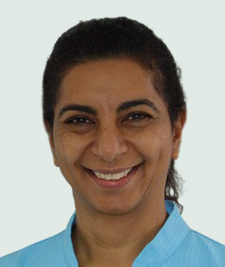 In 2014, Zainab completed a Master's degree in Clinical Dentistry & Oral Surgery at Edinburgh University and until recently was contracted by NHS Cambridgeshire to work as an oral surgeon at Brookfields Health Centre. Her experience and skill with complex extractions means she will be a valuable asset to the team and save patients the inconvenience of having to be referred to specialist clinics.